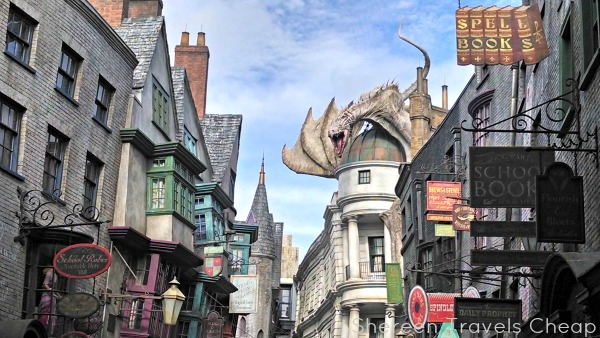 Coming into Diagon Alley, the first thing you see is the giant white dragon perched atop Gringotts. 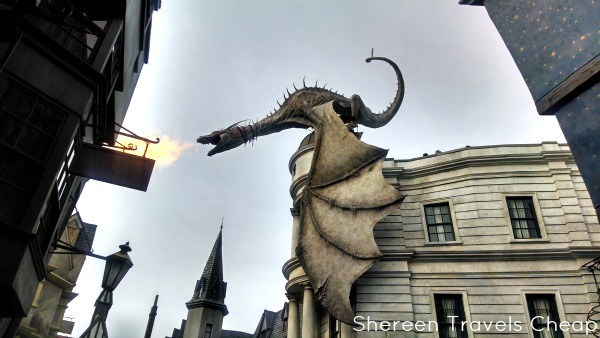 The dragon breathes fire every 10 minutes and is simply amazing from every angle. 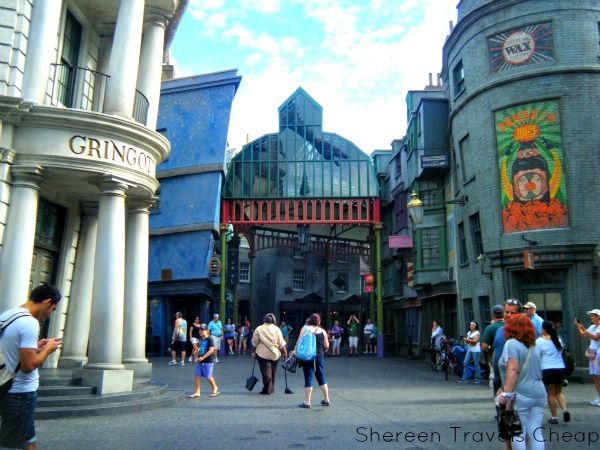 She is the major landmark here and leads you right to Escape from Gringotts, which I'll get to in a minute. 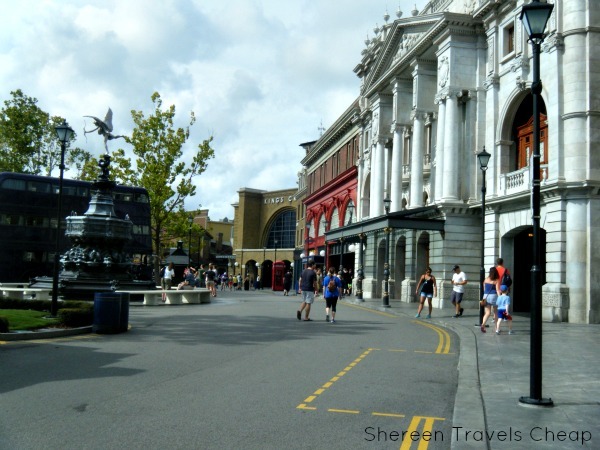 First, let's look at the London street where you go from Universal into the immersive world that is Harry Potter. 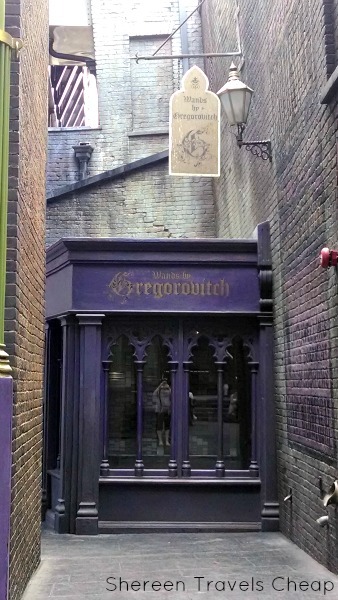 I always loved the idea that you enter the Wizarding World though a seemingly normal part of Muggle London. There's a record shop and a book shop and the Leaky Cauldron is just sort of hiding in plain sight. Unfortunately, you can't make your way into the magical world through the pub here, because it is an actual eatery. 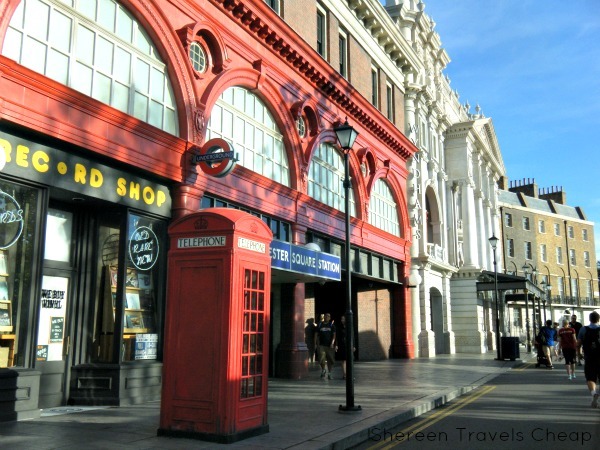 Instead, you head past the closed tube station and through a wall that hides the open brick wall that opens onto the quirky and bright wizarding street. Before you go in though, enjoy other Harry Potter landmarks, like King's Cross Station, the phone booth that lets you into the Ministry (dial 6-2-4-4-2 to hear a special message from them), the Knight Bus and King's Cross Station, where Harry and his friends went to get onto Platform 9 3/4 to take the train to Hogwarts. 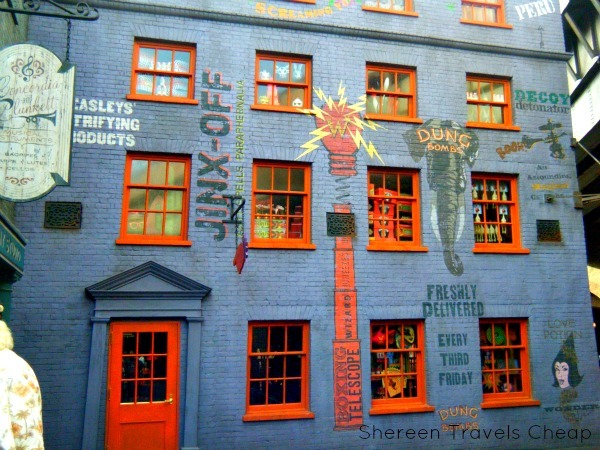 Weasley's Wizard Wheezes is the largest building in Diagon Alley, though it also houses Quality Quidditch Supplies, and has tons of wizarding gear, candy and joke goods. The building is super colorful and inviting, as well as bendy and fun. I doubt even the people who work there have seen all there is inside and out. I love the adverts on the outside of the building for the products you can find inside. I don't think Lockhart's charm worked on Eric. He was more interested in choosing which of his dragon pics was the best for checking in. I adored the conservatory-esque dome over part of the Alley. 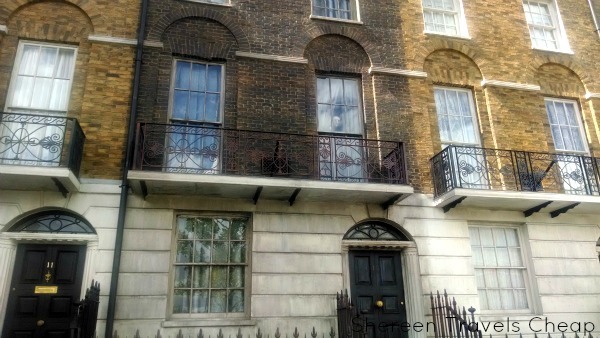 It is reminiscent of a London market and is also a nice respite from the blazing Orlando sun. Under the dome you can do some shopping, visit the money exchange for Gringotts, get a cool drink and watch several shows that happen every half hour. The lovely actors from W.A.D.A. 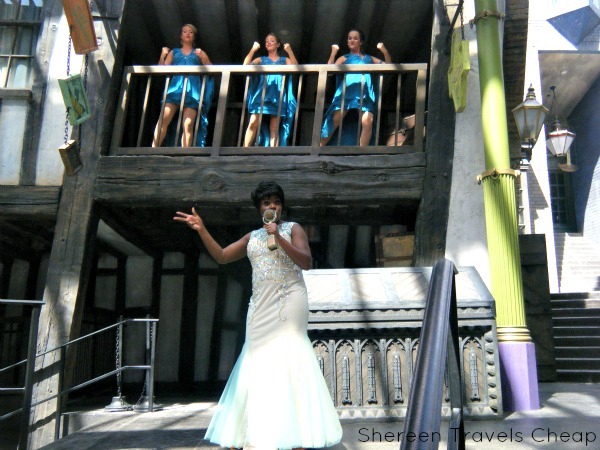 (Wizard Academy of Dramatic Arts) perform a tale from Beedle the Bard every hour and on the alternate half hours you can catch Celestina Warbeck sing her heart out, along with the help of her Banshees. If you don't want to be part of the show, possibly stand a little further back than we did, as Celestina will pick a guy from the audience to sing to and then to dance with the Banshees. Luckily, Eric is a good sport. Here is a quick video of some of her performance. 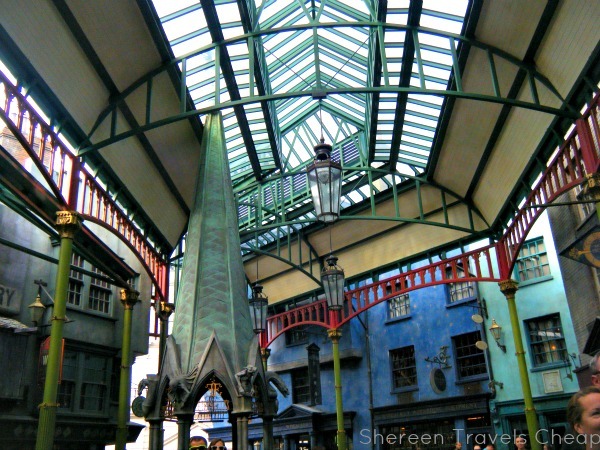 Everywhere you turn there are wizarding gems and amazing details. 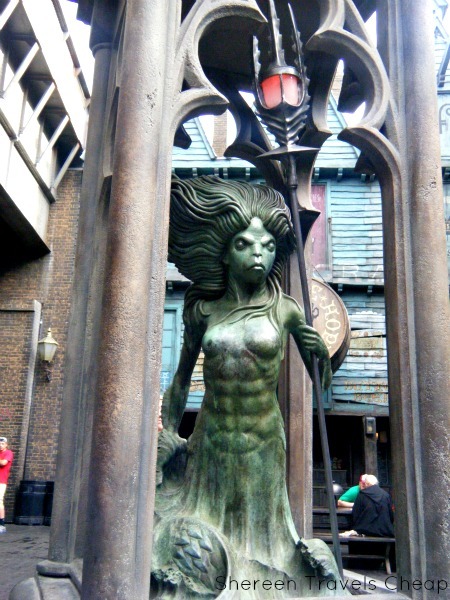 One of my favorites was this mermaid fountain that recalls Harry's time in the Black Lake in Goblet of Fire. Gregorovitch sold his wands to the Bulgarians in the books (Viktor Krum has one), though other wizards bought from him as well. 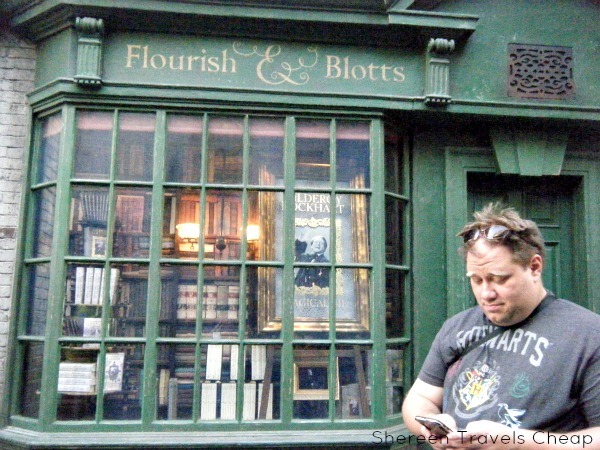 We never learn where he actually set up shop, but a small outpost is snuggled into a corner in Diagon Alley, enabling you to purchase a wand without going all the way to Ollivander's. There's no show here and the shop is quite small, but they have a good selection and it's not packed with people like Eyelops is. Are you actually a Parselmouth? 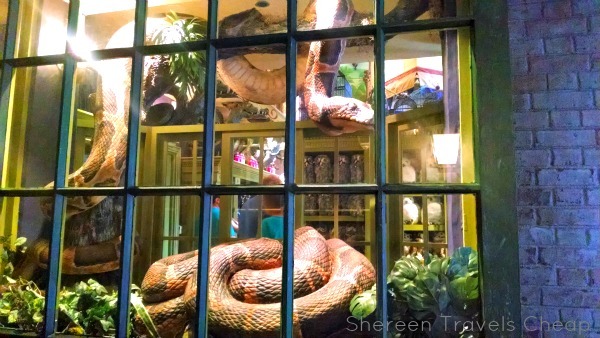 If not, how could you understand these gorgeous snakes that call Magical Menagerie home? 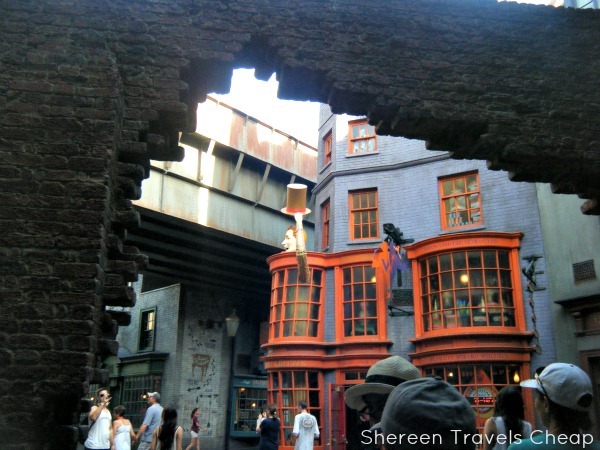 This is just one of the cool things you'll find in Diagon Alley if you take the time to look around and poke in the nooks and crannies. Some store fronts are just that. Store fronts. There's probably a storage room back there, but in order to mask it, they've put something wizardy there for your enjoyment, like this fun deli that sells stewed eels and some sort of fish pie. 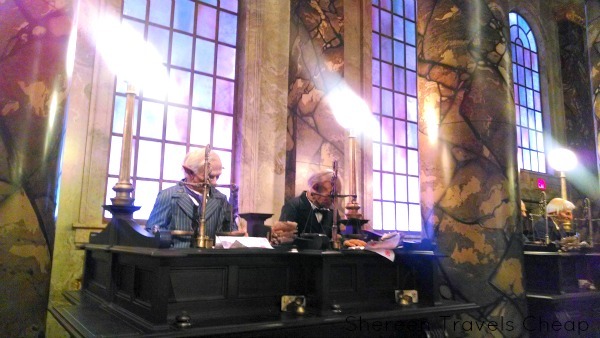 Ever since Harry's first trip into the wizarding bank Gringott's, I've longed to go inside and see just how awesome it was. 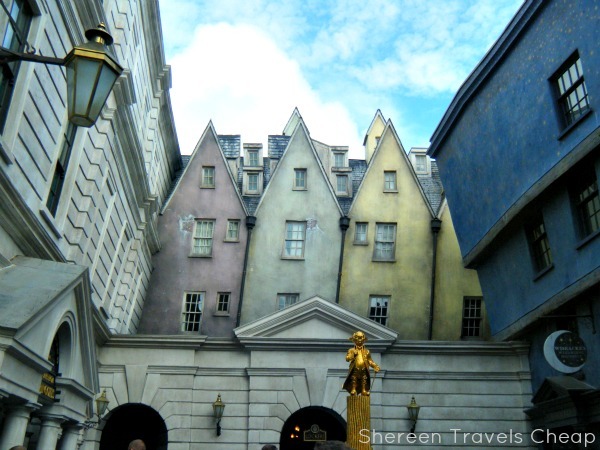 Well, with the Escape from Gringotts ride, you get to experience the awe that Harry felt when he first stepped inside. The ride itself makes you wonder how angry those first riders were after waiting 5-7 hours for it. I mean, what? We were lucky that the lines on the days we were there were pretty short. We never waited longer than 30 minutes. The best part is seeing all the goblins working, walking by the vaults and offices and checking out the Daily Prophets and ledgers. After you make it past those points, you are ushered into an elevator that'll take you to the deeper vaults. It's a ride all on its own. Make sure you stand near a wall and hold onto the handrail, then look up! 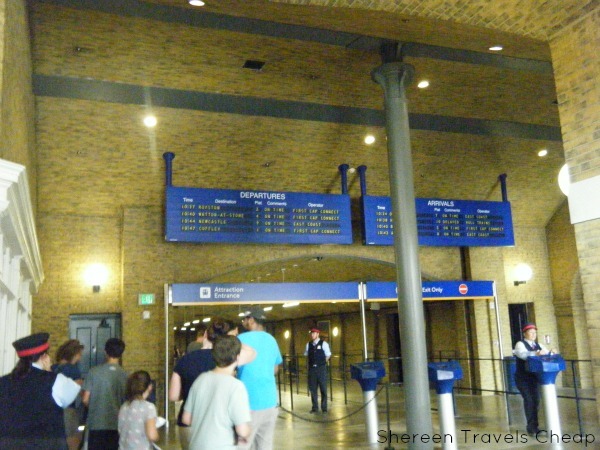 So, once you've had your fill of Diagon Alley, you'll want to make your way out and into King's Cross Station. 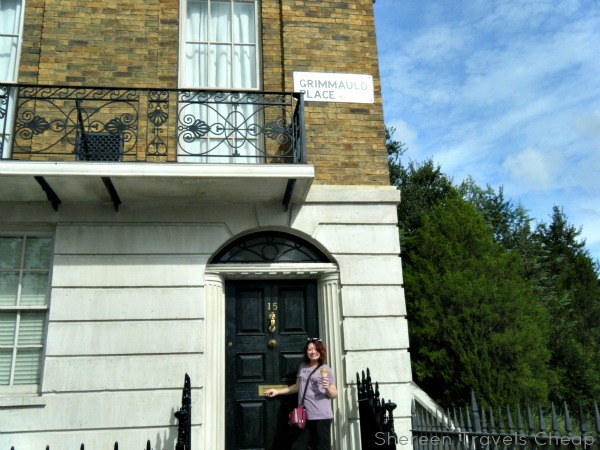 It looks just like it does in London, only smaller. I love the arrivals and departures board, plus there are ads along the walls just like the underground stations in London. 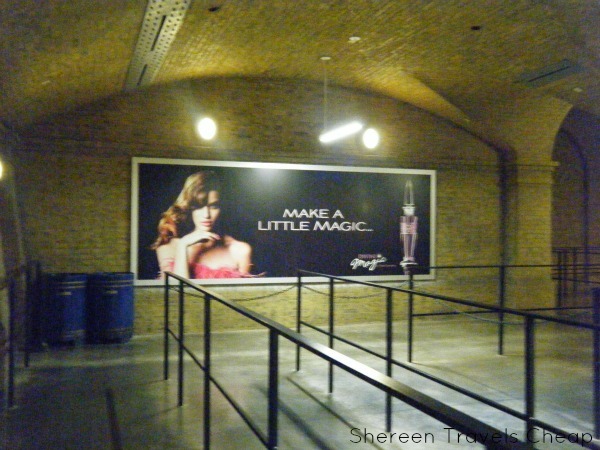 You'll catch sight of that awesome perfume ad from Half Blood Prince, walk through a tube shop that sells snacks and beverages, head through the magical barrier between platforms 9 and 10 and then you're on the train to Hogsmeade. Again, you will need a park-to-park ticket to ride the train, as it goes to the other park, so make sure you have it handy before you head into the station. 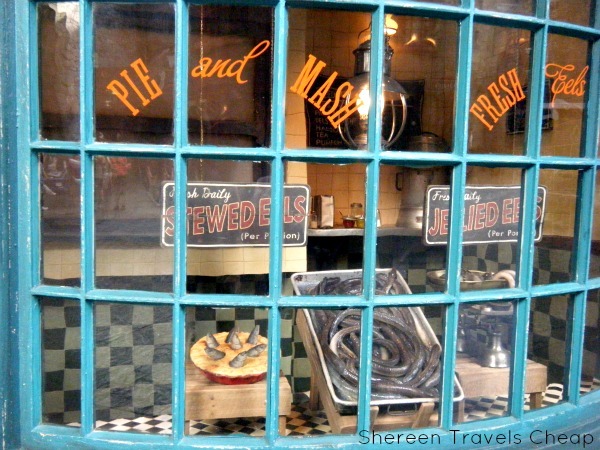 I'll be focusing on the foods and snacks of the Wizarding World in another post, as well as Knockturn Alley. 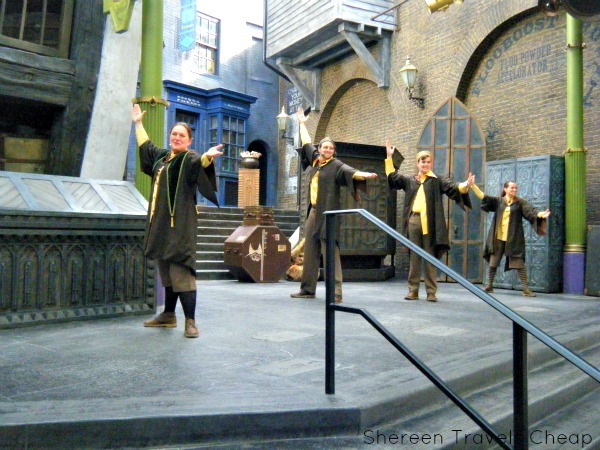 Learn more about Hogsmeade, the train and the interactive wands here. What's your favorite part of Harry Potter?